This document uses Ubuntu 18.10 in conjunction with PostgreSQL 10 with PostGIS. Similar concepts should apply to other installations. 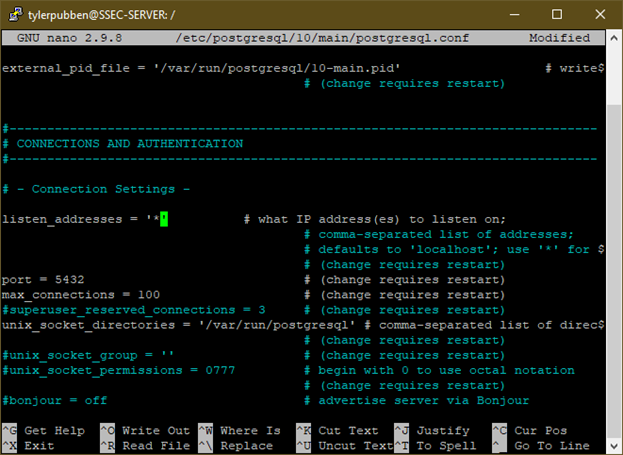 It assumes PostgreSQL has been installed with the PostGIS extensions already. Use CNTR-X to exit, save when prompted. 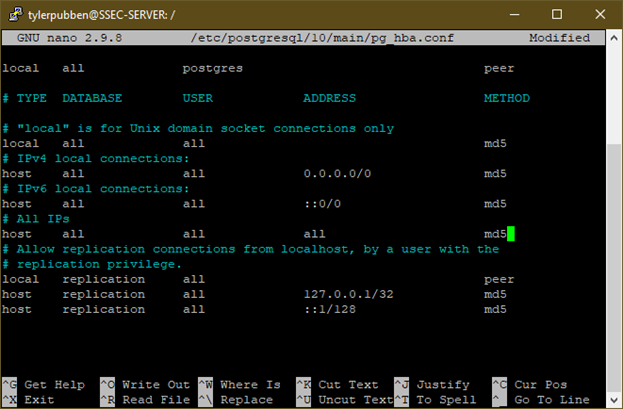 Next, use nano to change the pg_hba.conf file. This file allows access to the database cluster for users with encrypted passwords. In most business situations where all employees are under one roof or use a VPN to connect into a business network it is possible to connect directly to the GIS server using its local IP address. Servers that need to be accessible over the internet for remote workers or workers not able to connect in via a VPN connection need to be routed accordingly by your network hardware. This means that all requests to port 5432 are routed to the PostGIS server. If more than one server is on the local network, it will be necessary to specify a different port than default for PostgreSQL. After that is completed, it will be necessary to also ensure that your network has a static IP address or you are using a DNS forwarding service. This is beyond the scope of this document.